The Linear Variable Differential Transformer (LVDT) and Rotary Variable Differential Transformer (RVDT) are both common types of electromechanical transducers primarily used for measuring displacement. These two position sensors are useful tools because they can provide accurate measurements with minimal noise or interferences, and can achieve tiny resolutions. But there are also significant differences between a Linear Variable Differential Transformer and a Rotary Variable Differential Transformer. This post explains the major differences between linear and rotary transducers. The primary components of a Linear Variable Differential Transformer (LVDT) include a permeable nickel-iron core entwined with one primary and two secondary coils or windings. The mechanism is encapsulated in epoxy and magnetic shell, and protected with an exoskeleton of stainless steel. The object for measurement is mechanically coupled to the LVDT through the core’s threaded hole. A cross section of a Linear Variable Differential Transformer is shown below. On the other hand, Rotary Variable Differential Transformer’s (RVDT) housed assembly is composed primarily of an iron-core bearing, a primary or main input coil, and two secondary input coils. 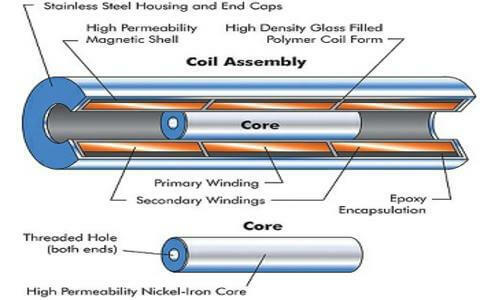 The input coils or windings are electromagnetically connected, so a fixed alternating current excitation on the primary stator coil during rotation can be used to measure the angle of the input shaft. The output coils are positioned to signal the magnitude and direction of the rotation when the shaft is displaced. The charts below illustrate the circuit and components of a Rotary Variable Differential Transformer. The LVDT and RVDT are designed to measure different types of displacement. The term displacement refers to the measurement of magnitude and direction from an initial position to a final position. In other words, it is the distance between the starting point and end point of an object’s motion expressed in meters. Linear Variable Displacement Transformer (LVDT) measures the displacement in a rectilinear motion of an object. LVDT devices can pick up linear displacement as minute as a millionth of an inch and as wide as 30 inches. Rotary Variable Displacement Transformer (RVDT) measures the angular displacement of a conductor during rotation. The RVDT then expresses the input angular displacement into linear output proportion. The rotary and linear variable differential transformers have many points of differences, but they basically complement each other’s functions. They ensure that you obtain displacement measurements for linear and rotating conductors quickly and accurately. In the electrical industry, efficient and effective task execution necessary to support household and business operations, and ensure public safety. Having LVDT and RVDT close at hand helps you perform each electrical job properly and successfully.